ZFNs are attractive tools which allow to edit genomes and are significantly empowered when combined with the efficiency of viral vector delivery methods. Indeed transfection techniques do not allow to fully use the potential of these genome editing tools, for in vitro, in vivo and transgenesis applications. Including a ZFN in an episomal lentiviral vector allows high increase of the efficiency of this tool as illustrated below with ZFNs targeting GFP sequence (figure). These ZFNs have been assayed on a Hela cell line which contains the GFP coding sequence in its genome. 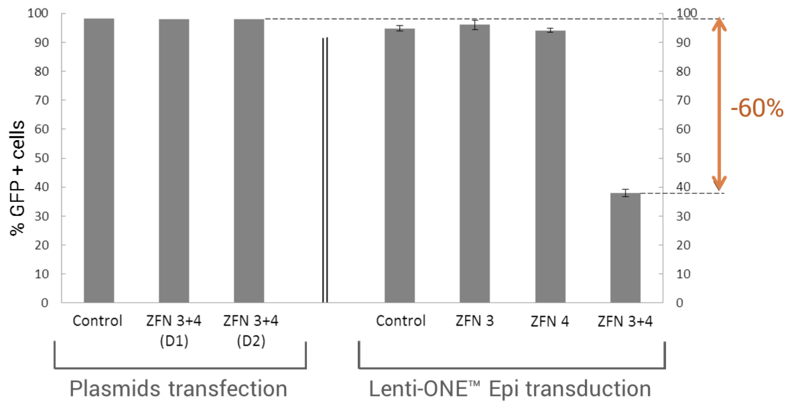 The results demonstrate that targeting GFP sequence with episomal lentiviral vector ZFN is much more effective than with transfected ZFN plasmids: GFP-ZFN can knock out up to 60% of GFP expression when delivered with a Lenti-ONE™ vs only 2% when delivered through plasmid transfection. Treatment of a Hela cell line containing the GFP coding sequence in its genome with (i) plasmids (D1: 10ng, D2: 100ng) or (ii) Lenti-ONE™ IN(D64V) (100ng of p24) ZFN3 and ZFN4 which target GFP coding sequence. Consequently, Lenti-ONE™ ZFN are tools of choice to generate KO in vitro, in vivo or in transgenesis. If you want to vectorize your own ZFNs, contact our On-Demand Services.